Influenster sent me a 40 packet box of nectresse to try from my Sugar 'n Spice VoxBox. Nectresse is a 100% natural no calorie sweetener made from monk fruit, that is about 150X sweeter than sugar! Each orange packet is equivalent to 2 teaspoons of sugar. Nectresse also comes in a 140 serving canister so you can use it in the recipes that call for sugar. I love that I got the packets, so I can take them with me. I love that it comes in a canister, so you can use as much or little as you want. The nectresse website is awesome. It contains information about nectresse, which is made by the same maker as Splenda, has coupons, shares recipes, provides a free sample, information for health care professionals and videos. I used my nectresse packet in my coffee and in my tea. I found that I needed less packets because one packet is sweet enough. It has a taste similar to sugar, but it is a little different. It is noticeable at first, but after awhile you barely notice. It has a little aftertaste, but it goes away once you get used to the taste. You can buy nectresse at any drug or grocery store. The website even provides a store locator. The box of 40 packets costs around $3 and the canister is almost $6, which is what I would expect to pay for sugar substitutes. I usually use Splenda or Equal. I like that nectresse is 100% natural, and I think that's worth getting used to the taste. I love sweet things, but I don't like consuming the calories. I would definitely recommend this product for diabetics who can't have sugar, and for anyone that uses a sugar substitute or thinking about trying a sugar substitute. Go check out their website to get your free sample today! If you want an invite to Influenster, let me know and I'll send you an email. For other reviews of this product, you can check them out on Influenster's review page of this product. I received three Colgate products in my Influenster Sugar 'n Spice VoxBox which I was excited to try out. I got the Optic White 360' Toothbrush, Toothpaste, and Mouthwash, which promised whiter teeth in 5 days, when you use all three products together! Usually I am very skeptical when it comes to toothpaste whitening promises. I've tried the Crest Strips, to all the whitening toothpastes, and I really haven't seen much of a difference. I drink a lot of tea, Coke and coffee and all three stain my teeth, so I'm always looking for products that will *really* whiten my teeth. As you can see, it looks like an ordinary toothbrush, but it has two features that promise optimal whitening. The first is the whitening cups. If you look down the middle of the toothbrush you will see 3 white circles that are lower than the surrounding bristles, and those are the whitening cups. The second feature is the polishing bristles, which help whiten teeth by polishing away surface stains, and cleans hard-to-reach areas. The toothbrush also boasts a cheek and tongue scraper and an easy to hold non-slip handle. This product comes in 3 different flavors: Sparkling Mint, Cool Mild Mint, and Enamel White. The flavor I tried was Sparkling mint. It comes out white, tastes like mint, but is NOT overwhelming. I REALLY like this toothpaste. The first time I used it, I could tell that it whitened my teeth. I love this toothpaste, and I probably won't change until I find a better product. I use Crest and Sensodyne as well, and they don't whiten my teeth like this. And this is where the secret is. After using this mouthwash ONCE, I could tell a MAJOR difference! I really couldn't believe it. BUT, no pain no gain. This mouthwash is REALLY strong. The directions state to swish 15ml (3 teaspoons) for 1 minute, twice a day. After about 30 seconds the liquid starts to bubble and the edge wears off slightly. It's a really strong mouthwash, I'm not going to lie, but the taste is tolerable and does not include alcohol, which is very important to me. After 5 days there was a major difference! The trick for me was to lean forward and let the mouthwash pool across my front teeth, instead of laying on my tongue for the whole time. Plus it starts to foam, and the taste isn't so strong. By using all 3 products, in 5 days my teeth were noticeably whiter, definitely by 3 shades which is the Colgate promise. It removed my surface stains from tea and pop. I have been using this regimen for over a month, and I can tell a big difference, and I am more confident to smile. I will be using these products from now on! 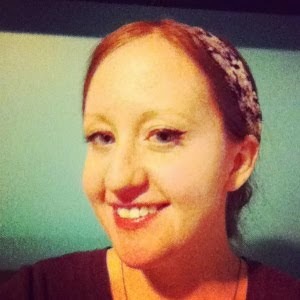 Thank you Influenster for this major change in my life! AND this pic is after I had dinner and didn't do my second whitening! Also the pic tint is a little off, but you can from the first pic a major difference. Go get some Colgate Optic White and brighten your smile today! I swear on it! The Colgate Optic White Toothbrush sells for around $5, the toothpaste for around $3 for 4 oz., and the mouthwash for around $3 for 8 oz. These products have been spotted at Walgreens, Rite Aid, Walmart, CVS, and other grocery stores. I find these products to be priced very reasonable compared to other similar products promising the same results. Today is the start of Sew Mama Sew's Giveaway Day. Duh, if you just read the title. This is MY, like 5th, most exciting day of the year. Twice a year, a ton of people (more than a few hundred), GIVE AWAY fabric, accessories, craft stuff, but I'm in to win the Fabric. I have rested ALL weekend for this. I haven't touched my computer for about a week. I have a TON of stuff I need to do today, including a Guest Post for poor Christina, who probably wants to throttle my neck by now, my Influenster posts, and of course entering ALL those wonderful fabric giveaways. Plus I have a big secret that is burning a hole in my soul, and I'll tell you all about THAT one later. I'm so grateful that my computer seems to be working at 100% speed today! Totally MIA and my Bday! I have been SO SICK the last few weeks. It started as hives in the evening, and I would stay up trying not to rip the skin off my thighs and legs and upper arms. My Dr took her last vacation before switching healthcare companies, so I wasn't able to get in right away. I've been on Prednisone (a steroid) since Monday. I feel nauseous and sick most of the time. I have Attarax, which is very similar to Benedryl and I slept through Tuesday. My bday is today-May 3!!! and I'm going to see some friends before I get caught up on SO.MUCH.WORK. on the computer that I've missed out in the last week!! I've been having a lot of emotional issues about this week, mostly brought on by another dose of my BC shot that I get every 3 months and the Prednisone. I'm getting older and it just feels like nobody cares, and we have always gotten a lot of attention on our bdays. My sister gets more attention on my bday than I do. And I hate myself for feeling this way. I guess it's because it's one day of the year, that I want back, and I think I deserve that. All the other days, except Ash's, it can go back to not having Angie around. And I hate myself for saying that. I want to end this on a positive note before I jump into the shower and "start" my day. Ugh. I hate these meds, so so so much! My influenster stuff, that I have taken pics of (the opposite problem that i had last time), but I haven't written up a lot of the articles. Thankfully, I started with the Colgate product so I have 3/7 done! I just need to edit, update and post. So Sorry for the multiple postings!